History: 65 year old male with a history of “abdominal” malignancy presents with chest pain and shortness of breath. 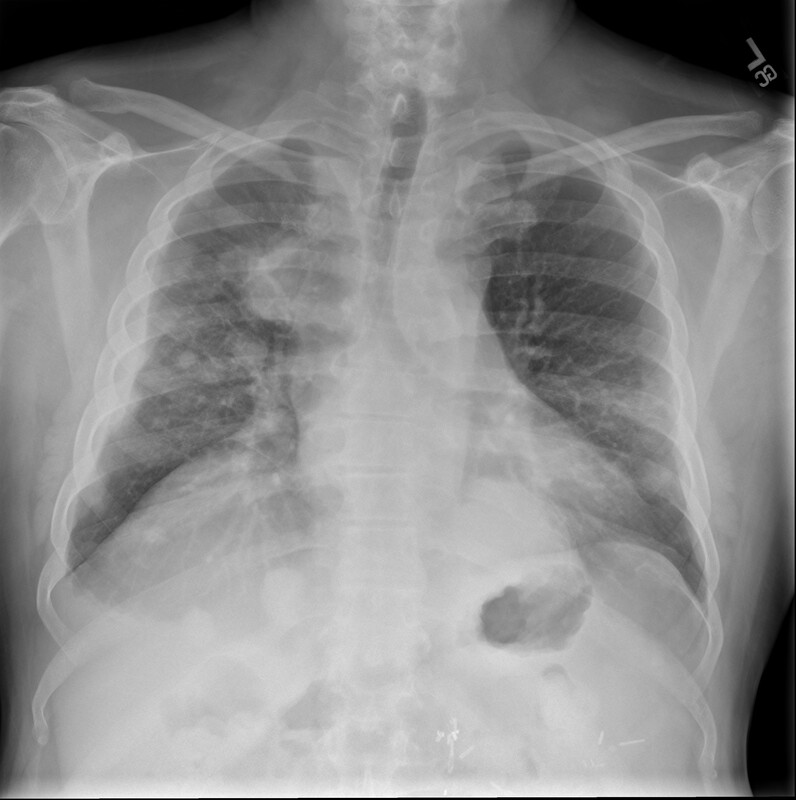 Pulmonary Metastatic Disease: Single frontal radiograph shows multiple scattered nodules throughout the lungs. Additionally, one large confluent retrocardiac opaque mass is seen, as well as a medial right upper lung mass. This is a case of metastatic disease to the lungs (pulmonary metastatic disease). Can you determine the likely primary cancer? Take a look at the film again. See the surgical clips in the abdomen. The patient has had a left radical nephrectomy from his renal cell carcinoma. Renal cell carcinoma metastases to the lung can take on multiple forms, including solitary masses, ill-defined hemorrhagic masses, or multifocal metastatic lesions, as seen in this case. The route of spread is typically hematogenous, and the lung is the most common organ that it metastasizes to. Metastatic disease to the lung classifies this cancer as Stage IV. Stage IV. Renal cell does not have a stage IVB in the 7th edition of the AJCC staging manual. Thank you, Dr. Meyer. Corrections always welcome!